The pioneers did not leave their selections very often. A trip to buy supplies once a month may have been the only outing. Once the land was cleared visiting neighbours was the only form of social contact. As more people came into the area small settlements began providing services such as hotels, stores, churches, tennis courts and schools. Essential for the flow of food, clothing, lighting and building materials, early stores played a crucial role in the life of the early settlements. Nothing was more important to a pioneer community than its store. Once a settlement of any size was established some one started a store. The store provided food stuffs such as flour, sugar, tea and salted meat, tools, building materials, kerosene and basic clothing. The better the transport the better the supplies. 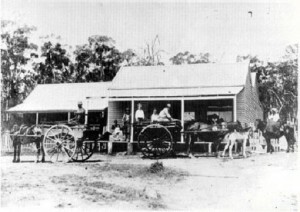 As a result early South Gippsland stores were very basic in the early days before the railway in 1891. 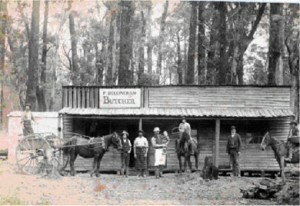 Bellingham’s butcher shop, Leongatha. The Buffalo Store, a typical South Gippsland general store. 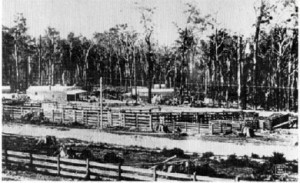 Leongatha’s Roughead Street in 1890, featuring cattle yards and two stores. Often the first solid building in early townships, they were also a statement of confidence in a district’s future. 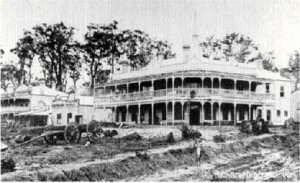 In many areas of Gippsland the first structure in a settlement was the hotel. Often someone would establish a sly grog shop which was a hut or tent and sell grog from there. When a license was obtained a more substantial building was erected. The original Bair’s and McCartin’s hotels in Leongatha are examples of this phenomena. Many decisions were made in the hotel because it was the only solid building to meet in. Hotels even bark and slab structures were important as places of entertainment and accommodation. McCartin’s Commercial Hotel Leongatha 1890. One of the first buildings in the town. District selectors often donated land and provided the building for early schools. 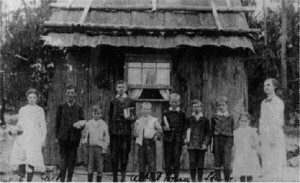 The first school in South Gippsland was at Woolamai in 1866, then Grantville in 1874. 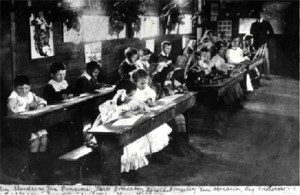 When families settled an area the provision of a school was important and members of the community wrote to the education department requesting a school and teacher. 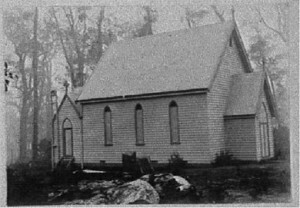 In Poowong the community volunteered to construct a school building so a school could be established in 1878. It was compulsory for children to attend school for 30 days each quarter but even this was difficult especially in winter. Early schools were very simple buildings. They were often chock and log or slab structures and it took many years for the proper weather board buildings to be constructed. 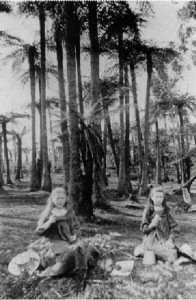 An early school, note the dead trees in the background and the young pine trees. Before chuch buildings were established, travelling clergywould meet in homes, stores and the great outdoors. The people of the late nineteenth century were keen to have religious services. Travelling clergymen held services in peoples homes, in stores and in the open but these visits were few and far between. It took many years for the pioneers to gain regular visits and actual church buildings. Churches were great places for social contact and many community activities revolved around the church. The focal point of many small communities, also serving as school and church where needed. Simple community halls were also built so members of the community could meet and organise social functions. Often the simple slab hall also served as the school and the church. 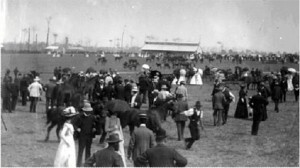 Shooting clubs may have formed first, but tennis clubs often had the first clubrooms. The first sport to organise clubs was shooting. It was seen as important for men and boys to be taught to shoot. It was also important to practise and shooting clubs were formed and competitions held. It is interesting to note that tennis courts were probably the first sporting facilities built. Often a court was constructed next to the hall or school and all society members could enjoy a game. 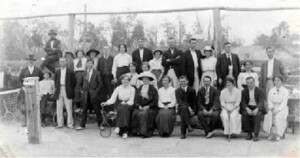 Leongatha tennis players around 1900. Bowls Clubs were another early recreational activity. 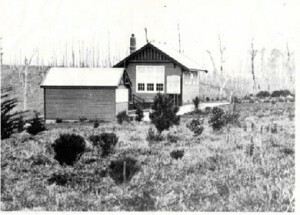 The first one in Leongatha was built near the railway station. 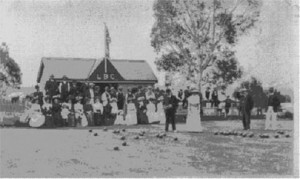 The Leongatha Bowls Club circa 1895. Surveyor Lardner surveyed a Recreation Reserve for each surveyed township. These were used for early sporting events such as cricket, football and athletics then later Agricultural Shows. They were important for the community and still are. We should be grateful for the forward thinking of these early government surveyors.